The iOS mobile operating system powers a series of multimedia devices created by Apple, including the iPhone, iPad, and iPod Touch. Four Grand Theft Auto games have been released for iOS devices: GTA Chinatown Wars (2010), Grand Theft Auto III (2011), Grand Theft Auto: Vice City (2012), and Grand Theft Auto: San Andreas (2013). iFruit is an application for iOS devices linking into Grand Theft Auto V.
As the devices run the same operating system and applications, they are quite similar in functionality. The iPod Touch is essentially an iPhone minus the telephone functionality, and any other functionality which requires a SIM Card - whilst the iPad can be described as a larger tablet version of the iPod Touch. More expensive versions of the iPad, however, have 3G mobile Internet functionality. Apple has also released a smaller 'iPad mini' and a lighter but bigger 'iPad Air'. While all applications designed for iOS run on all devices, many applications are released in an 'HD version' optimised for the iPad. These iPad versions of applications are often more expensive than the iPhone and iPod Touch version. Recently, however, many developers are moving to developing 'universal apps', which use hardware detection to determine which device to optimise for. Applications developed for iOS must be approved by Apple, and released via the 'App Store'; An online store which can be accessed via an application on the device or through Apple's iTunes software. Like with the PC versions of the series, the GTA games on iOS devices also support modifications, although your iOS device must be jailbroken first. Also, not all modifications are supported. GTA Chinatown Wars was quietly released onto the App Store at midnight on January 18th, 2010. The game features the same missions available for the PSP version. One difference is the lack of the Rockstar Games Social Club - the bonus Xin missions, which were previously only available after completing the main story line, locating the two Lions of Fo and syncing the device to Social Club, are now available without the use of Social Club. A new radio station allows players to use a custom radio tracklist from their iTunes library. This version features the enhanced graphics of the PSP version released after the DS iteration, but re-introduces the touch screen functionality of the DS, replacing the quicktime events supplemented in the PSP port. In October 2011, Rockstar Games announced a 10th Anniversary Edition of Grand Theft Auto III would be released for mobile phones and tablets, including the iPhone, iPad, and a selection of Android devices, released in autumn of 2011 (Northern Hemisphere). The only iOS devices that support the game are those with with the A4 or newer processor. These include the iPhone 4 and later, iPod Touch fourth generation and later, and all versions of the iPad. A prerelease screenshot of Grand Theft Auto III on iOS. 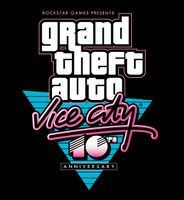 The 10th Anniversary Mobile Edition of Grand Theft Auto: Vice City was released on December 6th, 2012 on select iOS devices alongside the Android version. GTA Vice City supports the same devices as the iOS version of GTA III: the iPhone 4 and later, iPod Touch fourth generation and later, and all versions of the iPad. iFruit is an app released on iOS devices by Rockstar Games that allows players to customize in-game vehicles and also to create license plates (regular or a vanity-style license plate). This app also allows players to teach Chop new tricks. The mobile version of Grand Theft Auto: San Andreas was released in December 2013 on select iOS devices alongside the Android version. The Xbox 360 Remastered version of the game is based off of GTA San Andreas Mobile Edition. 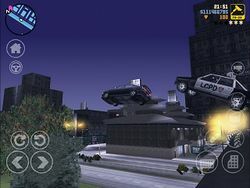 Unlike the earlier versions of the game, the vehicles in the mobile version of GTA San Andreas accelerate to their highest gear rather quickly. Social Club membership is required for cloud saving. Gameplay of GTA San Andreas on an iPad mini, with modifications installed. This page was last modified on 27 April 2015, at 01:55.